The fact that cancer immunotherapy is considered to be a safe and successful weapon for use in combination with surgery, radiation, and chemotherapy treatments means that it has recently been chosen as Breakthrough of the Year 2013 by Science editors. Anticancer vaccines have been extensively tested, in this field, both in preclinical cancer models and in the clinic. However, tumor-associated antigens (TAAs) are often self-tolerated molecules and cancer patients suffer from strong immunosuppressive effects, meaning that the triggering of an effective anti-tumor immune response is difficult. One possible means to overcome immunological tolerance to self-TAAs is of course the use of vaccines that code for xenogeneic proteins. 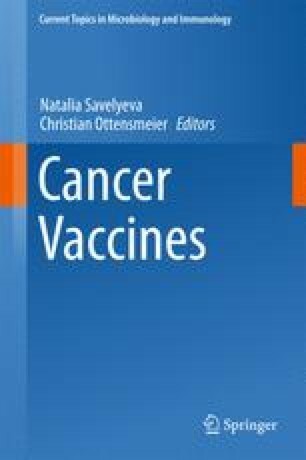 However, a low-affinity antibody response against the self-homologous protein expressed by cancer cells is generally induced by xenovaccination. This issue becomes extremely limiting when working with tumors in which the contribution of the humoral rather than the cellular immune response is required if tumor growth is to be hampered. A possible way to avoid this problem is to use hybrid vaccines which code for chimeric proteins that include both homologous and xenogeneic moieties. In fact, a superior protective anti-tumor immune response against ErbB2+ transplantable and autochthonous mammary tumors was observed over plasmids that coded for the fully rat or fully human proteins when hybrid plasmids that coded for chimeric rat/human ErbB2 protein were tested in ErbB2 transgenic mice. In principle, these findings may become the basis for a new rational means of designing effective vaccines against TAAs. The authors thank Dr. Dale Lawson for his revision and editing of the article. This work was supported by grants from the Italian Association for Cancer Research (IG 11675), University of Torino, the Compagnia di San Paolo (Progetti di Ricerca Ateneo/CSP), and Fondazione Ricerca Molinette Onlus.